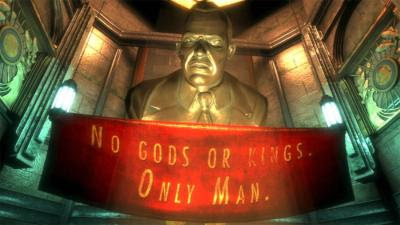 When I last wrote about it, I referred to BioShock as a tour of Rapture: a game whose overall experience shows a dying city, each location illustrating a history, sense of community and utter insanity, as well as hints towards what used to be a once prosperous place, one which thrived until political and social turmoil caused chaos amongst its citizens -- the remnants of the past clearly obvious amongst the destruction and violence that seeps throughout the underwater tunnels now. That was then. Now, just before the release of the sequel, I have played through BioShock again as a way to reflect upon the game with the Vintage Game Club. My description of Rapture above highlights what I believe to be BioShock's best character. The game wouldn't be anywhere near as good as it is if it weren't for the incredible attention to detail, design and personality that emanates from Rapture's foundations. Andrew Ryan, Fontaine and Doctor Tenenbaum may all seem like they are the key characters of the game -- and plot wise, they are -- but my interest in them doesn't come out of respect for who they are or what they might represent, but rather the parts they played in the creation, history and personality of Rapture. 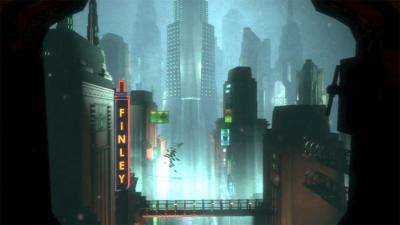 Their influence over the underwater city, as well as many other people, can be seen all over and its this ubiquitous presence that not only defines Rapture, but allows the player to be immersed in its atmosphere and gives them the sense that this is -- or was -- a living, breathing city that is as real as any of the ones you might find up on land. It's this overall perception of Rapture that fascinated me the most and is undoubtedly one of, if not the, main reasons why I love BioShock so much. Allow me to elaborate by using the opening level in the game as an example. Bias towards the game aside, the opening level of BioShock has to be one of the best out there, doing everything it needs to in order to set a tone, atmosphere and fictional setting that compels us to continue. 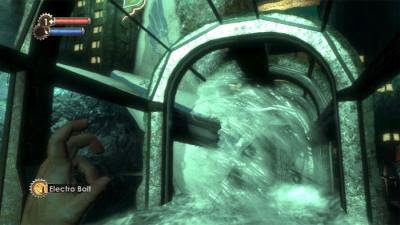 From the opening discovery of the bathysphere to the onslaught of Splicers at the end, the entire chapter not only communicates the information crucial to our experience, but demonstrates everything the player needs to know about BioShock's gameplay, the city of Rapture, the central characters within, and how to deal with the deranged Splicers. 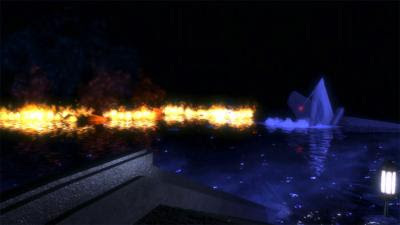 Not only does it do this with confidence and respect, it also nails the atmosphere that permeates the entire game, enticing you with its unique personality and instilling feelings of isolation, fear, wonder, and amazement at what is being seen. Throughout the entire chapter you are uncomfortable with your surroundings, experimenting with what you find whilst wondering just exactly what it all means -- exactly the kind of reaction to this weird, surreal place that you would expect anyone foreign to Rapture to have as they familiarize themselves with this unbelievable place. It's visceral, in a remarkably beautiful way, and it immerses you into the game like few others manage to achieve. It's also cohesive, which I believe is crucial to its success. Right from the get go the game hooks you in, the "Would You Kindly?" phrase whose deceit we'd later discover clearly visible on the note that comes with the 'package' from Jack's parents. The plane's tail slowly sinks into the murky depths below, re-appearing a little later when we walk through Rapture's many tunnels. We learn about the political ideals that guide Rapture's civilization, propaganda banners serving as constant reminders -- but we also see the revolt against this, abandoned protest signs suggesting to us the turmoil that led to the chaos and destruction we now get to explore. We see signs of commercialism with the posters on the walls, the dollars we find and the neon signs we can see outside Rapture's many windows. The sea itself gives off the illusion of being distant, but water seeping in and leaking through cracks in the glass remind us of the reality that this is a city built under water, flooding and ruins only a moment away if the buildings we're in start to give way. Life and death is everywhere, the fish outside passing by as another body is found on the ground, blood everywhere and his/her belongings spread out across the floor. Elements of humanity contrast with insanity: the relationship between the Big Daddies and their Little Sisters highlighting the importance of companionship while deranged splicers are controlled by a mind that has lost its way. We're guided by Atlas, his articulate Irish charm explaining our surroundings as we progress, calming our anxiety and helping us through this uncomfortable environment. 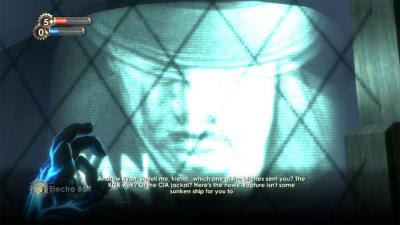 We learn about Andrew Ryan, influenced to believe he is our antagonist through what we're told and shown, our impression of him reinforced when Ryan himself speaks to us, questioning our presence in his domain and accusing us of being spies for the CIA or KGB -- he isn't sure yet. 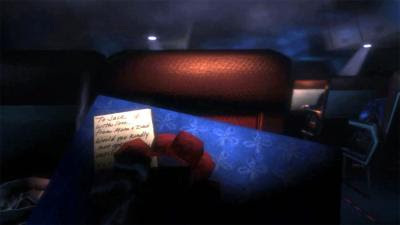 Within this chapter are so many subtle moments that not only setup the game, but the whole experience: the mechanics we'll be using to interact with and explore Rapture; the prominent rivalry between Ryan and Fontaine, our own presence causing concern for the former whilst the latter secretly controls our every move; the personality the place once had demonstrated by things like the New Years Eve party that was held in the Kashmir restaurant, the billboards advertising products and events on the walls, and the artifacts (left-over bottles of wine, cat food, luggage strewn across the floor) showing the consequences of a once civilised city; the history of the political rivalry as well as the ideals and desires that formed the foundations of Rapture's signature; and the reality that the destruction of this city doesn't just leave it in ruins, it leaves it as a memory: the beautiful waters outside flooding the once prosperous society. It's a remarkably powerful opening and really lays down the foundations of what the rest of the game's experience will be. This introduction alone is enough to make Rapture as a whole compelling to explore and really intriguing, but it's not the only element to do this, either. Tomorrow, I'll elaborate on the other areas of Rapture that define its society, as well as our tour throughout. For a similar but different perspective on Rapture's opening chapter, I suggest you read Michael Abbott's take.